I was getting the chocolate bars for free, but even so I was haunted by the I could make that vibe as I set off to explore the site. I had this idea that the bars would be way better or more fun or something similarly vague yet persuasive if I made them myself. And I certainly wouldn’t pay for something I could make in my own kitchen. Then you add up to five toppings. I had a lot more fun picking them out than I expected. Not that I didn’t expect it to be fun; it was simply more fun than I had anticipated. There are six different topping categories (excluding seasonal categories): fruit, spices, nuts, confections, decor and grains. The heading “grains” includes a lot of things I wouldn’t consider grains–most notably bacon and flower petals–but it’s a fun category with a lot of variety so I’ll forgive them if something got lost in the translation from their original German site. The pictures of the toppings appear against the variety of chocolate you’ve chosen, making it easier to imagine the overall aesthetic effect. Clicking on the names of the toppings takes you to educational and entertaining descriptions. 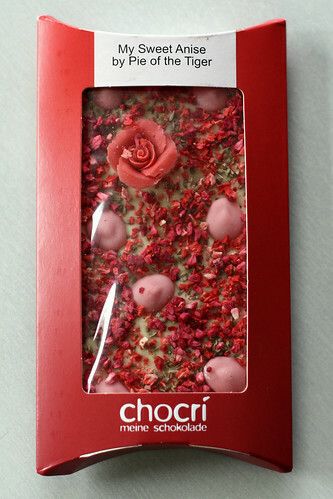 If you’re looking for inspiration (or just want to leave the creativity to someone else), Chocri has a page of recommended creations and top five bar names of the week lists on their blog (as I was researching for my review, I saw that one of my bars made the list…very fun!). According to their website, there are more than 10 billion possible combos. I’ll take their word for that, because I don’t have time to do math these days beyond how long the Microfoodie has been napping. (Forty minutes at the moment, in case you’re curious.) Faced with such a vast selection to choose from, I decided to take advantage of the opportunity to give the bars names (up to two lines of text on the packaging) and create them each with a theme based on something in my life. Time passed, and my bars showed up more or less on schedule, maybe a day or two later than the estimated date of arrival. I was very impressed with their appearance; the red boxes are quite striking against all three types of chocolate. It was fun seeing the names I’d come up with for the bars right there on the packaging, looking very crisp and professional. What really got me excited was the look of the bars themselves. I never expected the toppings to be arranged with such care and artistry. That appeased a large part of my remaining I could do that. 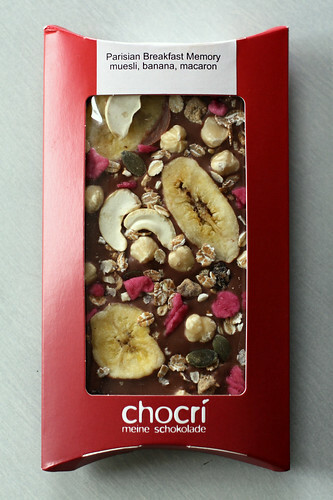 One of the main reasons I would have wanted to make a bar like this myself was to give my inner perfectionist control over what it looked like, but the bars from Chocri pretty much satisfied that desire. On the back of each box a list of the toppings appears along with the code that allows you (or the recipient, if the bar was created as a gift) to reorder the exact same bar in the future. 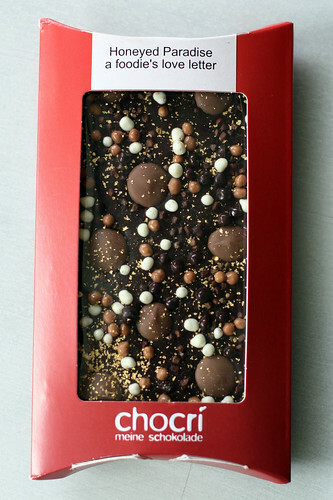 Inside the box, the bar is wrapped in shiny plastic, lending a glamorous sparkle to the toppings beneath. I know, I know, it’s wrapped in plastic, big deal, but for some reason I thought this particular plastic wrapper looked sharp and special, seeing as it was holding my own creation. One of the things I was most surprised with was how thin the bar was. 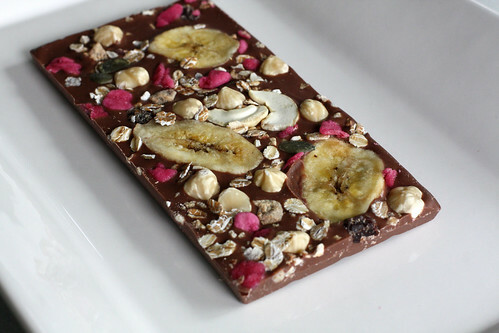 Most of the toppings-heavy bars I’ve seen offered for sale have been chocolate-heavy as well. 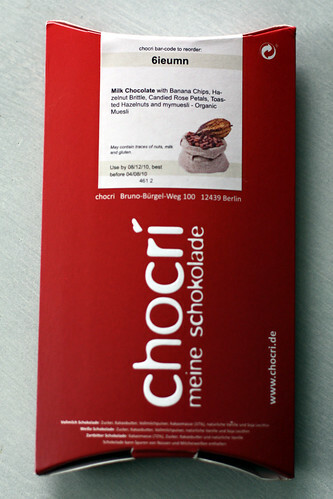 While you might expect less chocolate to be a negative thing, I liked the chocolate-to-toppings ratio of the Chocri bars. Keeping them on the thinner side also accentuates the well-tempered snap of good chocolate. I designed this first bar with Chris in mind, drawing on his love of honey, fine liquor, spices and spiciness. This was the biggest visual hit of the three bars, its appeal based in the monochromatic exploration of texture enhanced by the dusting of glittering gold. In other words, we thought it looked cool. The grains of paradise came to mind because I was a bit disappointed in the chili options among the toppings, which were limited to chili powder and whole dried chilies. We all quite liked the way the subtle and unusual spiciness of the grains of paradise played off of the strong fruit notes in the chocolate and the sweetness of the honey drops. However, at the end of every bite, everyone who tasted this bar ended up chewing on a grain or two that had gotten stuck in their mouth, a slight detriment to the overall experience. It sort of ruins the balance of flavors when one of them stays behind as a hard little nuisance between your molars. I understand why the spices are left whole as they’re much prettier that way, but I think it would be great if you could choose to have them ground before being added to your bar. I would’ve also liked the rice crispies to be a bit crispier and lend more crunch to the bar. But the flavor was quite an intriguing combination, especially the intersection of the chocolate, honey and grains of paradise components, and one I’d like to explore in my own chocolates in the future. We had some of the best and worst food of our European trip during our four days in Paris, scaling the heights with a rose-flavored macaron Ipshan from Pierre Hermé’s shop and plummeting into the depths with one too many baguettes laden with a few slices Swiss cheese and more mayonnaise than I had consumed up until that point in my life. Eating well as a vegetarian on a budget in Paris apparently takes more planning than I had done. Along with the divine macaron I mentioned and the fresh morning bread and pastries at the bakery half a block from our hotel’s front door, one of my favorite food memories of Paris is going across the street to the tiny grocery store. In fact, from that point on, I got excited at any chance I got to go to a regular food store. Not only because of the whole vegetarian-on-a-budget thing, which made the prospect of a banana and some really good yogurt exciting in comparison to what we found in the touristy areas of the cities we visited, but also because it’s fascinating to see what products are on the shelves. I was particularly fond of some hazelnut cereal bars I found in the little market in Paris. Americans don’t use hazelnuts nearly often enough. This bar spans the gap between the high class patisserie and the hole in the wall market not much bigger than a convenience store. Rose petals for the macaron, bananas, hazelnuts, hazelnut brittle and organic museli for the breakfast I had before I set out in search of the macaron, and Belgian milk chocolate just to round out the European theme. I think Troy, my best friend, said it best when he described the bar as tasting like a high-quality cereal bar coated in really good chocolate. All of the chocolate we got from Chocri was really, really good. But this was the one bar where I thought the toppings could have had a more assertive presence. 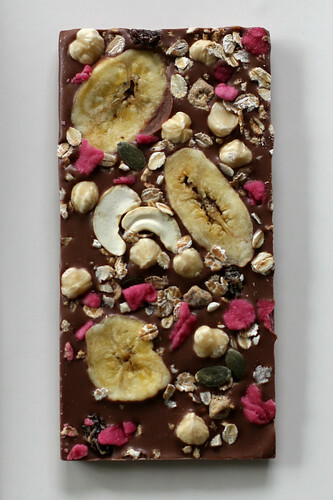 I think I would have liked it better if it really was a cereal bar covered in that chocolate instead of the other way around. I could barely pick out the flavor of the muesli, and couldn’t taste the rose petals at all. However, I did like the crunch of the toasted hazelnuts and the hazelnut brittle. a) Dilettante Chocolates, a local chocolate company, makes a white chocolate and anise truffle. This was possibly my first taste of a chocolate flavor pairing more challenging than peanut butter or caramel, and I still really enjoy it. 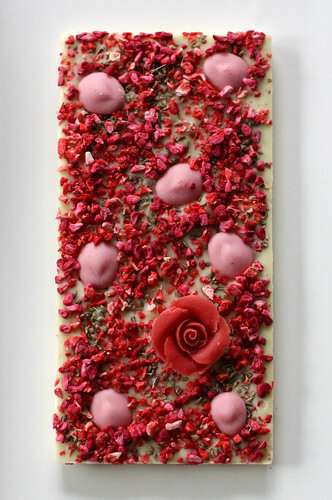 b) I wanted to put pretty red and pink toppings all over the white chocolate bar. 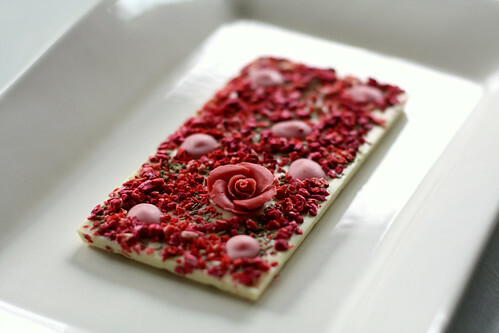 I think I meant to tie those two plot points together by connecting the romantic marzipan rose to my having first had the truffle at my brother’s wedding, or acknowledging the influence of this white chocolate and raspberry bar by Divine Chocolate that I tasted at the Seattle Chocolate Salon, but really, this one was almost entirely about the pretty. This bar was my unexpected favorite. Even my anti-white chocolate taste testers admitted it was good, and it turned out to be quite pretty indeed. Chris and Troy both felt the anise seeds presented the same problem the grains of paradise had in the first bar; I thought they were less of an issue in that respect than the grains of paradise had been. I loved the way the bold flavors–super sweet white chocolate, distinctive anise, acidic raspberry, bright raspberry and bold almond–both blended and stood out. Each one took it’s turn on my palate, the others supporting without detracting from the star of the moment. It was the sort of flavor progression I’ve admired in the best chocolates that I tasted at the Chocolate Salon last summer. Granted, I don’t think any adult could eat more than one square of this bar at a time, but that just makes the chocolate last longer, right? Overall, despite my nagging I could make this thoughts, I’d consider going back to Chocri to buy a bar in the future. Let’s face it, I’m not exactly overloaded with free time to putter around my kitchen making chocolates, and even when I was, I rarely got around to it. And I’d certainly recommend them to anyone who’s first thought when seeing these photos is I could get someone to make one of those especially for me? Cool. 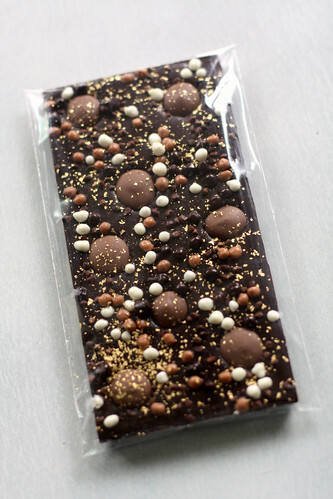 The prices are about what you’d expect for a chocolate bar custom-made with organic, fair trade chocolate and high quality toppings and presented so stylishly. Had I purchased them, my bars would have run in the $11 to $14 range. This puts the bars squarely in gift territory for me, as I’d probably make truffles to experiment with flavor combinations for myself. But a Chocri bar or the experience of creating one provided by a gift certificate would make a fun and delicious gift for almost anyone, from a sweet tooth with a favorite chocolate mix-in to a foodie playing with flavors to a kid piling on colorful candy. I had one other suggestion I was going to email to Chocri–sort of an Amazon Associates-style program where you could design a bar, link to it from your blog and earn a chocolate bar for every X number of people who bought your creation–but I see that they’ve recently started a program that’s almost as cool. 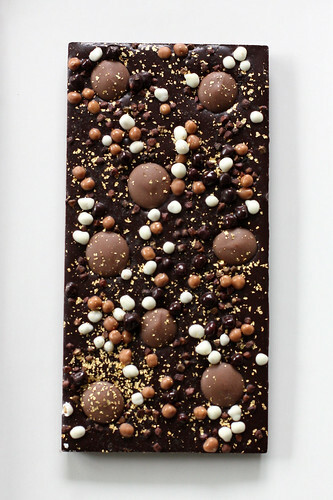 They call it the 5+1 Rule: for every five chocolate bars you create, they’ll add a surprise bar to your order. I have to admit that what they say about it makes me kind of curious to see what I’d get. Extra special bonus challenge: Whether or not you want to buy a bar, head over to Chocri’s site and design one based on a theme inspired by your life. Then come back here and tell me about it. I’d love to hear what other people come up with! Wow. 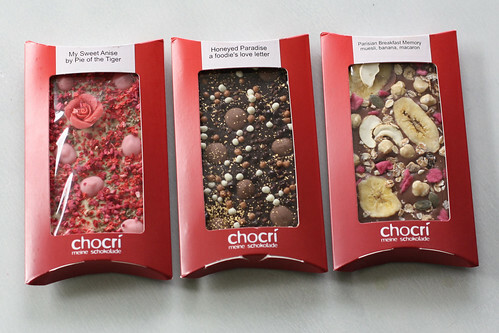 These chocolates look so cool and lovely! Wow, what a review. Thank you for the extensive feedback (very appreciated) and the amazing images! You’re welcome, and thank you…it was a pleasure! Chocri failed to send the gift I ordered! There is a very disappointed little girl in England. And the company will not respond to my inquiries. So frustrating! These chocolates are so stunning!! All I can say is that, I would like to savor just one(any one of these)while I am watching my movie right now! And if everyone here treats me well, I shall consider giving them a small piece! 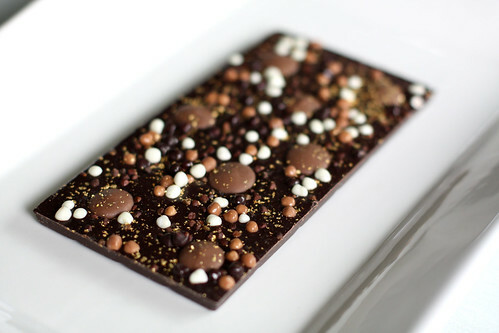 Wow, that bar is so beautiful, I couldn’t even tell it was chocolate at first! Looks like some lovely collage with the flowers and all. I’m unimpressed with Chocri. I ordered a dark chocolate bar w/ bacon and toffee and they send a bar with no bacon. Rather than call or email me to tell me they were having an issue w/ their supplier, they figured they would still send something that I didn’t order. Even worse, it was a Christmas present, and it was my wife who discovered there was no bacon in the bar. Further, the fact that their was no bacon and they said it comes from a supplier only goes to show they don’t make anything themselves…it’s all from 3rd parties. 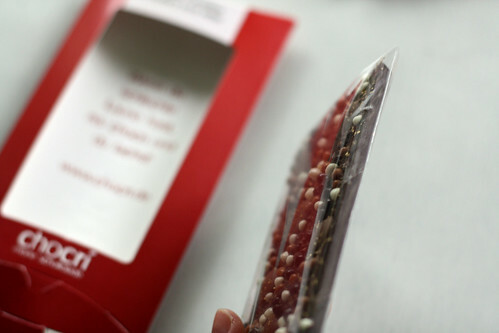 Makes you wonder if you can’t get a better chocolate bar w/ fresh ingredients elsewhere. I’m sorry to hear you had a bad experience. They definitely should have notified you. Though I will say that none of their ingredients struck me as being fresh/made in house. I think for something with fresh ingredients, you’d need to find a local chocolatier. As I’ve emailed you, Mark, many times, I’m sorry for how this played out. As I emailed you in my apology, our supplier couldn’t get the last batch of bacon through customs, so we had sold it, but couldn’t make bars with bacon. You were sent the chocolate bar without the bacon (along with your other chocolate bar) in order for it to be at least on time. You were also fully refunded for it, but obviously I can understand that you would be disappointed. I had a list of people to email that were missing bacon, but the holidays were so crazy that I literally didn’t sleep some days, and this was one of the cases where I just didn’t get the email out fast enough. I offered you a replacement as soon as we have bacon again (mid January), but didn’t receive a reply from you to that. Be assured that this was a rare exception, and please keep in mind that we’re only humans.